A painful story of Master NITHRSHAN, Documented by Joshin for his dreams comes true. “Papa.. I wanted to go to school with my elder brother holding school bag and books” when my son NITHARSHAN says every day, my eyes always fills with tears. My name is VIAKUNDAMANI. R, a daily labour from a poor family from Kalkulam Taluk of Kanyakumari district. 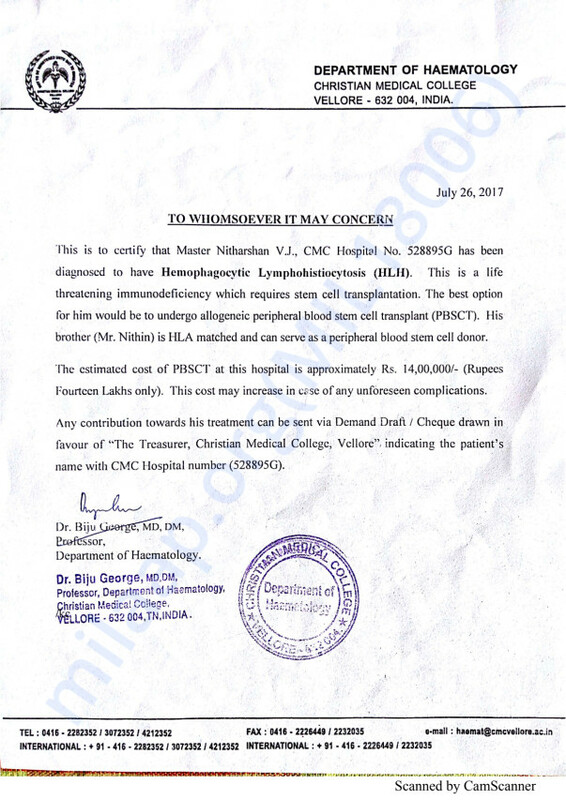 My son Nitharshan is suffering from Hemophagocytie Lymphohistiocytosis (HLH). This is a life threatening immunodeficiency disease. He needed a Peripheral Blood Stem Cell Transplant (PBSCT). When I look back, 10 years ago, my daughter Nithu also suffered the same disease and died on the age of one and half years. That time the medical science was not so developed and accessible to a man like me. We felt hopeless and did the cremation of my daughter with tearful of eyes. My son was suffering from frequent fever and infections, we realized that the symptoms are very similar to my daughter has. We took him to KIMS hospital Trivandrum. 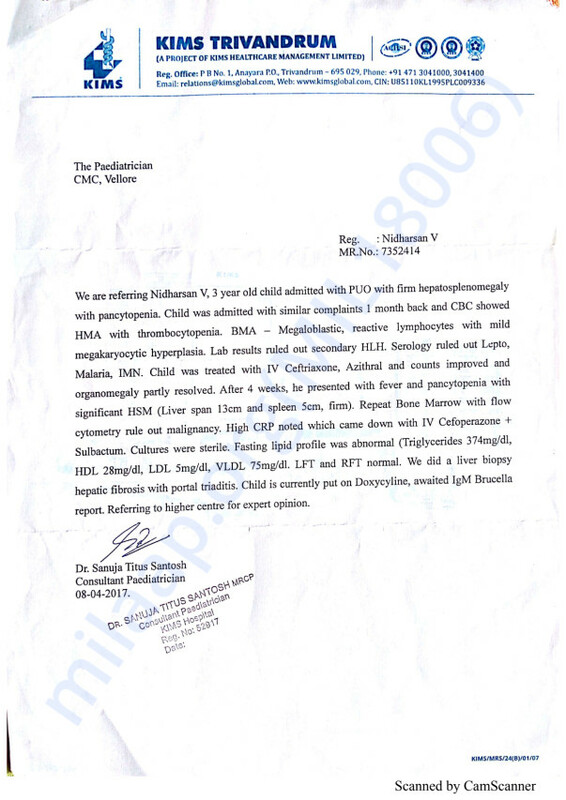 A month later, after several test and biopsy, they told us to consult with Christian Medical college, Vellore. In CMC Hospital, doctors did similar kinds of test and biopsy to confirm the disease. After several consultation, they confirmed they my son is having HLH disease. When we heard that, my son is having a life threatening disease and like my daughter, his life is in danger; my wife JENIFA went on depression and tried to convince me to commit suicide. For a time period, I also felt that Jenifa’s suggestion is the end of all our problems. Again I started thinking on our existence in the world. All the living things in the world have an end. This life is too small and prayed to Almighty to give strength to fight with the circumstances. Somehow, I convinced my wife to do whatever possible to our son and bring him to a healthy life. 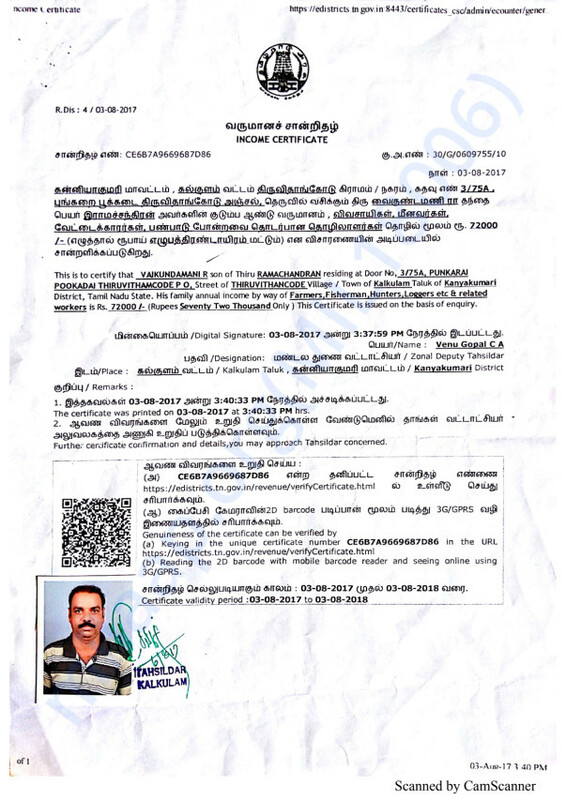 I have sold my land and did treatment in KIMS Trivandrum and CMC Vellore till now. Almost spend 7 Lakhs for his treatment. Being a daily labour, my earnings are very limited and somehow I was taking care of my family. In this mechanized world, an unskilled person cannot earn more than Rs.6000 in a small town. The estimated expense for the Stem Cell Transplant is Rs. 14 Lakhs. Post-surgery expenses are not estimated. Your valuable contributions will help us to bring our child to a new life. I wanted him to be doctor, that’s my dream for him. I would like to thank you all for the tremendous support and love showered on Nitharshan. I'm glad to inform you that his transplant was successful and he is back home. 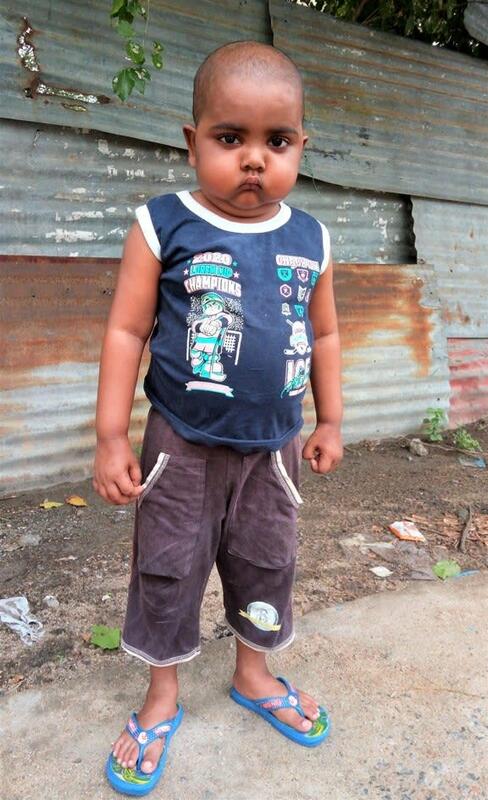 He had viral fever a month ago and was treated for the same. Presently, we have been taking him to the hospital for regular check-ups. Hopefully, he should recover soon. Please continue to support him by sharing the campaign and praying for his good health. We are grateful by all the love and support that he has been receiving from you all. 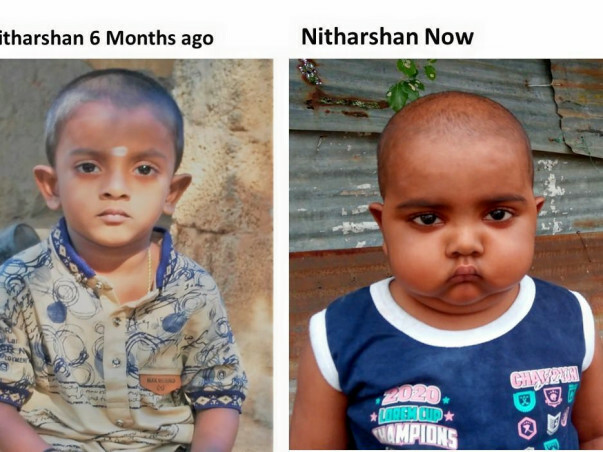 Here is an update on Nitharshan. 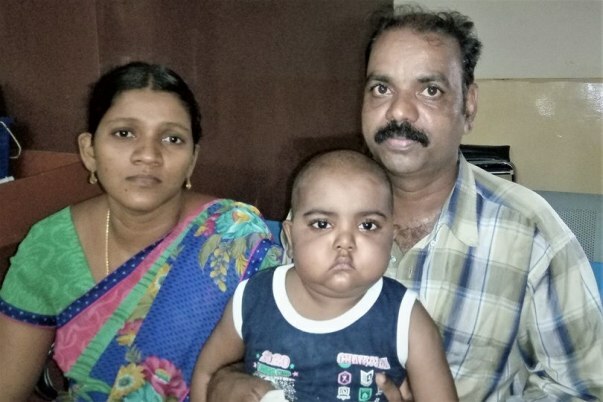 After conducting various tests, the doctors decided not to delay the stem cell transplant for Nitharshan. Nitharshan successfully underwent the transplant last week. His elder brother was the stem cell donor. He has to stay in the hospital for three weeks under observation. He is on medication for infection and fever he had after the transplant and is stable now. Thank you for your support and love for Nitharshan. Please keep him in your prayers. 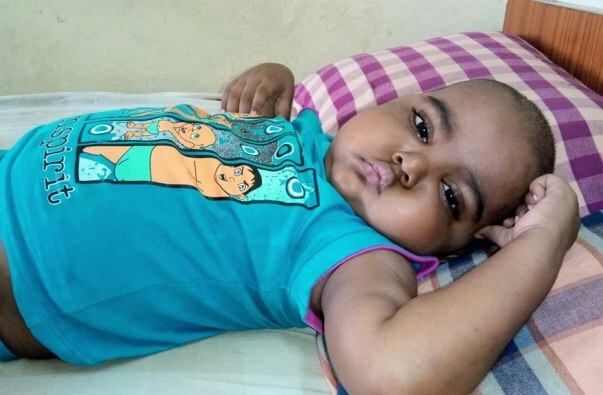 Nitharshan has been admitted to the hospital last week to start with new set of chemotherapy sessions. He has undergone four chemotherapy cycles. There are no major side effects and he is responding well. 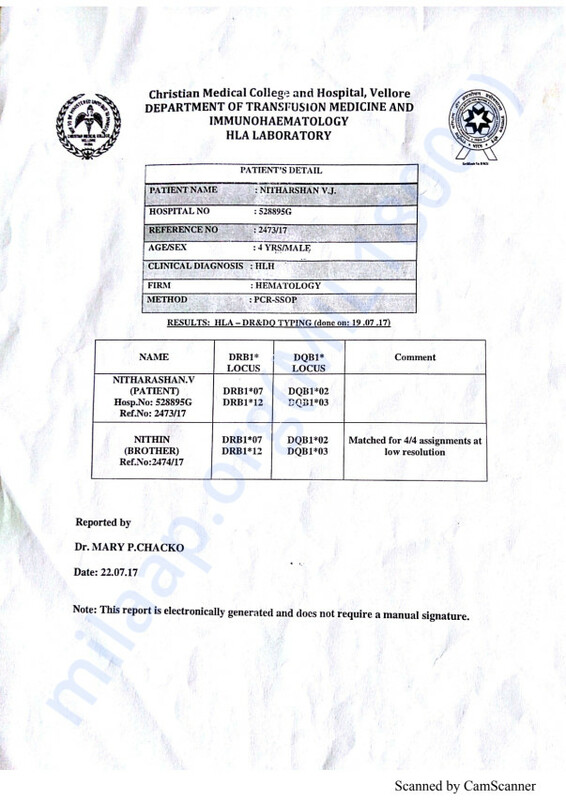 The stem cell transplant will be scheduled on arranging adequate funds. Thank you for your support and love. Please keep him in your prayers and share the campaign with your network to support him. May god bless you son.